My baby is almost one year old and he is still gluten free. I think that gluten has too much of an impact on their systems if introduced too early. Additionally if there is any family history of sensitivity or allergy to a food, it is best to wait to introduce that food until the baby is at least one year old. My son loves his pancakes that I make him. I use all different ingredients, but this one was a hit last night. I use organic ingredients almost exclusively, with the exception of some rare things that I can’t find. In a small bowl whisk together egg yolk, buckwheat flour and water until smooth (it takes about 5-10 seconds), add a little more water if you need a thinner consistency. Saute the mushrooms and bell pepper in olive oil until they are cooked through (I frequently add a tsp of butter as well). I do this over low for about 7-8 minutes. 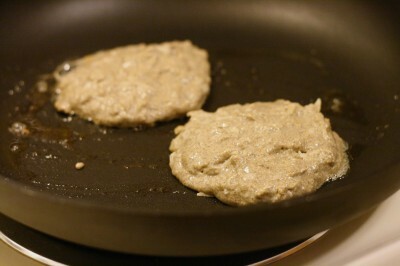 Then remove from heat and add the vegetables to the bowl with the pancake batter in it. Return the pan to the stove and on medium heat, melt the coconut oil. Once this has melted (it only takes a few seconds) then pour the pancake batter in as you desire. Sometimes I make one giant pancake, other times I make several mini ones. Cook thoroughly on both sides. This takes about 2-5 minutes per side depending on the size of the pancake and the amount of heat that your stovetop gives off. Once cooked, cool and cut into pieces and it’s ready to serve. Sometimes I add goat cheese to this and my little guy loves it.